By margreet riphagen, July 10, 2009 at 9:42 am . 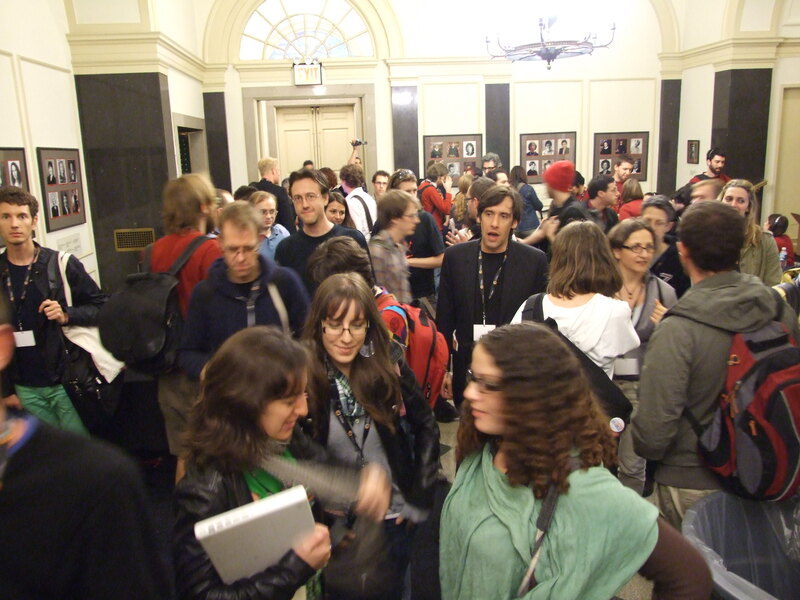 On June 19th and 20th 2009 the newly formed Open Video Alliance held their inaugural gathering, the Open Video Conference at NYU Law School in New York City. The OVA, a collective venture between an ad-hoc group of organizations dedicated to fostering the growth of open video, including the Yale Information Society Project at Yale Law School, Kaltura (the developers of the world’s first full open source online video platform), the Participatory Culture Foundation (creators of the open source Miro internet video player), and iCommons, managed to pull off an impressively well-organized first event. The conference was organized at a pivotal moment for open video, a moment when the tools for creating and disseminating video online are now prolific, a moment where 60% of the world’s population now possesses a mobile phone, where sites that YouTube have created an entire movement of user-generated content, and where remix culture is becoming a new major mode of cultural expression. With the concept of open video comes the need for beginning to find answers to the can of worms of questions that emerge with these fundamental changes in media consumption. As one of the first real attempts at beginning the dialogue between those concerned with open video—technologists, academics, entrepreneurs, artists, filmmakers, video creators, remixers, activists, archivists, as well as online video audiences—the organizers most certainly achieved their goal in bringing “energy, excitement, and enthusiasm to this important conversation.” Most impressive to see was that the framing of this conversation far surpassed a techy idea swap about open source and open codecs, and ventured into virgin territory that sought to investigate the possibilities for open video to a wide variety of groups, all working towards the goals of increasing transparency, interoperability, and further decentralization. Due to its wide emphasis on open video’s implications on software, politics, journalism, art, education, industry, business, technology, culture, communication, freedom, and democracy, it attracted interested and concerned people from every field, showing the almost infinite ways that people are pushing the boundaries of online video technology. The schedule was jam-packed full of interesting talks, each day with an auditorium and two seminar rooms with simultaneous lectures and panels. The over 800 participants illustrate that open video has a growing and now undeniable importance in today’s networked media environment. Elizabeth Stark of Yale ISP/iCommons gave the welcome in which she discussed open video’s potential for free expression, participation on the internet, and the overall power of video to increase democracy and free speech. She used the example of how video is being used by citizens in Iran to exposes injustices surrounding the elections, to point to open video’s participatory and decentralized qualities. According to Stark, these qualities allow it to become one of the most effective tools of communication. Shay David of Kaltura gave a few opening remarks as well, mentioning how the concept of open video is quite complex, as it is made up of technology, licensing and content, as well as the combination of all three. Next up was Yochai Benkler who’s Keynote was about the power of openness in a networked society to increase innovation and democracy. According to Benkler, openness began within software design and is now moving into rich and immersive space of video. He spoke about the implications of open video being radically decentralized, the change in open video offering free speech, justice, democracy, and overall movement from bottom up. He noted that the critical point is not necessarily market or non-market, illegal or legal, mainstream or fringe, but really the possibility of anyone to be affected, be creative, intervene and innovate. This is because human capabilities are widely distributed in the population, and the possibilities of free sharing and the information economy enable us to learn more and innovate faster, creating a more participatory culture, and a democratic public sphere. He discussed the concept of ‘distributed innovation’; the idea that the smartest and most creative people are never concentrated in the same institutions, but instead are dispersed throughout society. His last and most interesting thought was how we can build a platform to connect these distributed individuals to make best use out of their potential collaboration, and he noted that so far the Commons was the closest we have come. The next speaker I caught was Head of School of Media Arts of the University of New South Wales Ross Harley. His talk, entitled ‘From Open Circuits to Open Video’, tried to illustrate how the current moves toward participatory culture are echoed in the history of video art in the 1960s and 1970s, noting that video art has always been concerned with establishing alternative networks of communication based on ‘open circuits’ and ‘participation TV’. He called distribution the Achilles heel of video art works, because an artwork the biggest question that arises is: “How do we get it out there?” Hartley encouraged the creation of a distributed network archive of video art that would make use of the potential of web-based networks for sharing, participation and openness. He based his idea on the concept of open archives and open source codecs. He discussed the FLOSS (which stands for ‘free/libre/open source software’) ethos, as an example of a project, which gives more freedom in allowing users to aggregate, browse and distribute video. Harley envisioned the development of a global user generated video network which would allow for the preservation, distribution and contextualization of video art in a recombinatory fashion, and thus the creation of multiple instead of monolithic histories and as well as new works of art. The next event I attended was a Metadata roundtable called ‘Time-based Metadata’ which was a discussion of various implementations of time-based metadata by current practioners. Session leader Devon Copley, a Fellow at the Berkman Center for the Internet and Society at Harvard University, introduced the presenters. One of the highlights was the interesting project of Yovisto, an open source video search engine specializing on academic content such as lecture and conference recordings, presented by Joerg Waitelonis. Yovisto seeks to the problems of accessibility and usability of long talking-head videos with lots f academic content that is difficult to navigate because of their lack of metadata. Though they are valuable academic resources, these types of recordings do not have tables of contents or keywords to allow researchers or students to find the information they require. Yovisto uses automatic (speech recognition, object detection, i.e. face, as well as intelligent character recognition, which recognizes a change in layout) and manual analysis of their materials to identify important text onscreen, as well as scene breaks, etc. Another highlight was Abram Stern of the University of California Santa Cruz’s Metavid project, a community driven archive of legislative video from both houses of the U.S. Congress that has been built from day one as a free open source framework. Taking video that was previously ‘unwatchable’ (due to its length and lack of metadata), they have created an archive that gathers its metadata from outside sources and user contributions to make the videos searchable by speaker name, spoken text, date, etc. After lunch was the Working Group “Independent Video Platforms in ‘09’ where representatives from a variety of independent video organizations that engage with human rights, environmental concerns, social justice, were invited to assess the effectiveness of their niche roles to use open video to affect change in a YouTube saturated media environment. Discussion leader And Lowenthal from Engage Media, a Australian online video sharing site focused on social justice and environmental issues in the Asia-Pacific, opened the floor giving a quick run down of his organization, bringing up the difficulty in building indie media platforms that will effectively influence the mainstream in a media environment where the majority of activists are now using YouTube for dissemination of their content. Sameer Padania, Manager of The Hub, a online video interface for the human rights archive WITNESS, spoke about some of their biggest challenges: constantly adjusting to the online landscape which has shifted (and will continue to shift) dramatically, and changes such as the influx of mobile technologies/video. He prioritized the need to develop an independent power base online that makes use of interactive power in a different way than what has come before, and also trying to influence the majors (such as companies like YouTube) to be more human rights sensitive. The next session I attended was moderated by Sameer Padania and was called ‘Human Rights and Indigenous Media: Dilemmas, Challenges and Opportunities.’ Padania gave an introduction about where open video meets ethical concerns that are involved with human rights more broadly, and Indigenous rights specifically. He brought up the question of whether a culture of openness can be supported when it comes to concerns of consent, dignity, representation, and security for Indigenous communities. 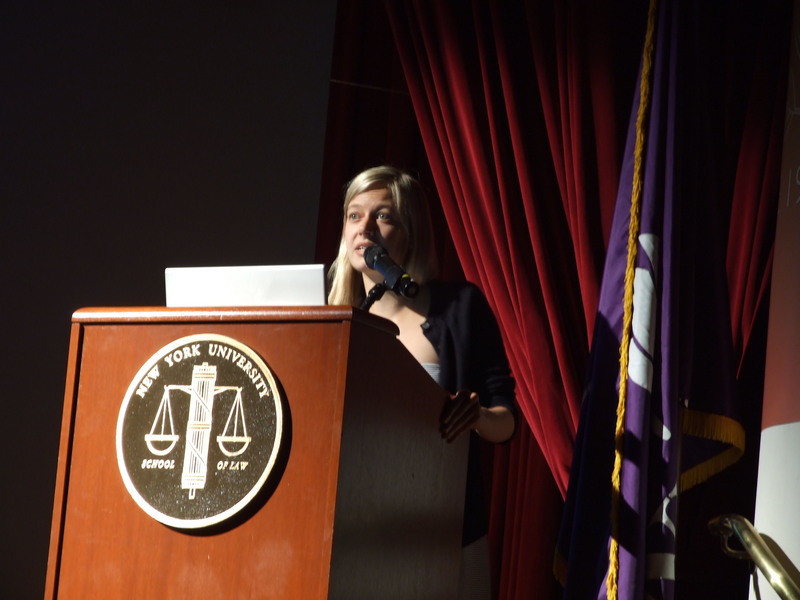 Human rights lawyer Leah Shaver, affiliated with the Information Society Project at Yale Law School, spoke about video is a powerful tool, and open video as an even more powerful tool, for promoting human rights. She used a powerful example of a dissatisfied public in Iran demanding justice. 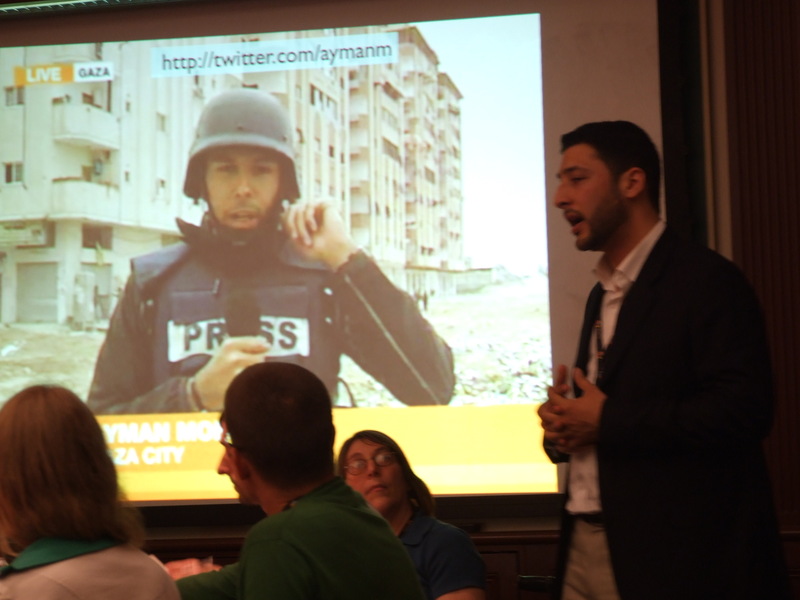 As ordinary citizens make powerful and affected videos of human rights violations, the ability to add subtitles to videos would have been a major stumbling block in the past. Recently, however the Huffington Post was able to pass on the subtitling request to their readers and 100,000 people received subtitling request instantly. This kind of networking is a powerful tool for advocacy. She closed with statements about how open video enables broader participation and inclusion, and creates a culture that everyone can access. Next, Program Director for WITNESS Sam Gregory gave a talk that was synched with a WITNESS compilation of videos and stills. He started by asking, how does open video culture relate to human rights? How can we share with open video community and broader community the ethical frameworks that are involved in bringing this kind of material into the realm of participation? The last speaker was NYU’s own Faye Ginsburg, who spoke about the movement of media technologies into indigenous communities, and the effectiveness of video for visibility; even the use of camera by Indigenous groups as protection. However, she also acknowledged the danger of open video when it comes to cultural protocols that vary per Indigenous community, i.e. when certain information that should not be shared freely with other non-initiated members of the community, or with outsiders. She gave an anecdote about how for Indigenous communities representation can have a very different and extremely serious meaning: last year, Second Life in collaboration with Telstra (the major telephone company in Australia) created a virtual Uluru (called ‘Ayer’s Rock’ in the west) complete with advertising billboards erected in front of this sacred place, parts of it unable to be seen by non-initiated members of the Indigenous community. She closed with the idea that human rights discourse breaks down at a point when dealing with ethical considerations such as these, and noted that the first way to deal with these concerns is to begin engaging in conversations with people about what is ethically acceptable and what is not. The last event of the first day was a discussion by David Evan Harris about the Global Lives Project, a participatory video library of human life experience, which began as ten video pieces, each 24-hrs long filming the lives of ten people from ten countries. However, since the beginning of the project, it has expanded to include free and open to contributions from the public. Inspired by Harris’ feeling that Americans did not know enough about international peoples, Global Lives affords viewers the chance to be situated in other people’s realities. That evening was the effervescent After Party down the street at (Le) Poisson Rouge with a stellar live video remix by Eclectic Method and Red Foxx and Bloodsugar, and lots of dancing! Saturday morning kicked off with a lively and extremely sharp Keynote by Jonathan Zittrain, Professor at Harvard Law and co-founder of the Berkman Center for Internet and Society (who replaced Clay Shirky which for reasons unannounced could not attend), based on his book The Future of the Internet—And How to Stop It. Starting off with an introduction about the power of crowds, specifically the ability for a community to decide what is right without outside supervision, exemplified by the Wikipedia trend, Zittrain went on to discuss the potentially negative side of for-profit enterprise making use of user participation on the web. As an example of this, he discussed the trend of internet companies getting humans to do small amounts of labor for a nominal fee, what he calls ‘captcha sweat shops’, such as LiveOps and Mechanicalturk. Directly after Zittrain in the auditorium, was a talk entitled ‘Industry Perspectives’, in which Zittrain moderated a group of industry experts on the future of online video, the balancing act between open and proprietary technologies, and importance of creating innovative infrastructures to support open video. Managers and CEOs from YouTube, blip.tv, Boxee, and Flash joined to discuss their experiences and frustrations with the need for to build the infrastructure to support open video from the ground up, since it just simply does not exist yet. After this short session was Keynote by Xeni Jardin of Boing Boing TV, and daily internet video program that was launched in 2007, just after the economic downturn began, showcasing “weird, eclectic material”. Jardin made the interesting point that media companies playing to the center are not surviving, for example Stage9 Digital, Disney’s new production company closed its doors in March 2009. How and why then are independent web video startups like Boing Boing surviving? She says the answer lies in their use of Creative Commons content, and their encouragement of remixing and reusing. One of the day’s highlights was the ‘Audiovisual Archives Birds of a Feather’ talk, which was lead by Amsterdam’s own Johan Oomen and Maarten Brinkerink, of the RD department of the Netherlands Institute for Sound and Vision. 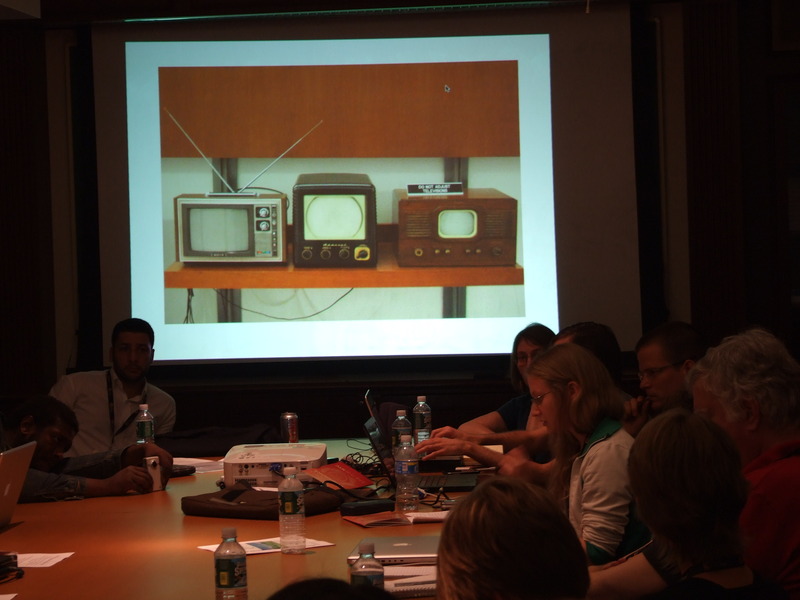 This session focused on what audiovisual archives are doing to offer parts of their collections online in order to encourage creative use of their content. Oomen gave the introduction, where he situated the discussion in terms of audiovisual archives being currently engaged in large-scale digitization due to the deterioration of the physical state of analogue carriers. He noted that a key mission for memory institutions is to make the material available online to large audience. In an environment where video viewing has shifted to the internet, libraries, archives and museums are changing their architectures to have more material freely available online. He asked a few key questions to the presenters, how successful will the ‘network archive’ be? Considering the moral obligation of memory institutions to provide open access, will Creative Commons prove to be a suitable model for heritage content? What are incentives for archives to adopt these models? How can business models coincide with more open models? Though the presenters did not directly answer all the questions at hand, Moeed Ahmad of Al Jeezera spoke about their Creative Commons Repository that has been in the works since 2005. As a traditional broadcaster, Al Jezeera is beginning to embrace Creative Commons by releasing ten hours of broadcast quality footage under CC license. He noted that so far the perks or doing this have been in improving reputation, distribution, financial gain, community empowerment, respect for their audience, and the chances that their competitors will do the same. Maarten Brinkerink discussed the Netherlands Institute for Sound and Vision’s OpenImages project, which is an open media platform for online access to audiovisual archive material available for creative reuse. The platform is based on open source and CC license and holds some 3,000 items from their own collection (for which they hold the copyright) in ‘browse quality.’ Another interesting panelist was, Sara Chapman, executive director of Media Burn, who spoke about the impossibility for her small archive to keep up with the cutting edge in online video, because of funding restraints. She also pointed out that not many archives have yet actually put a large percentage of their material online. To work within the budgetary constraints, Chapman provides access to her content via other platforms that people are already familiar with such as YouTube, archive.org, Miro, etc. She made the point that if it weren’t for existing and widely used platforms such as YouTube, less people would have access to their archival material. Due to some slight changes in the conference schedule, OVA announced a surprise guest as a close the conference. The guest was introduced by Alan Toner (director of Steal this Film) who began with telling the story of how Pirate Bay took Sweden by political storm. In 2006 the organization’s headquarters was raided, and mass demonstrations ensued, which ended up in the formation of The Pirate Party, now with over 50,000 members and having just won 75% of the vote. Toner introduced one of Pirate Bay’s founders Peter Sunder – live from Marbo Sweden via Skype. An inspiring interview with Boing Boing’s Xeni Jardin ensued, where Sunder showed his staunch beliefs that file sharing is a human right. He held that the laws should allow Pirate Bay because it violates so many other laws not to, such as: freedom of speech, privacy, and the free and open exchanging cultural ideas. Sunde made the prediction that the entertainment industry will have to compromise in a few years, as the environment media consumption is changing so rapidly, they will soon have no choice. The concepts of openness, sharing and collaboration were deeply woven not only into the theme, but the feeling of this unforgettable event.